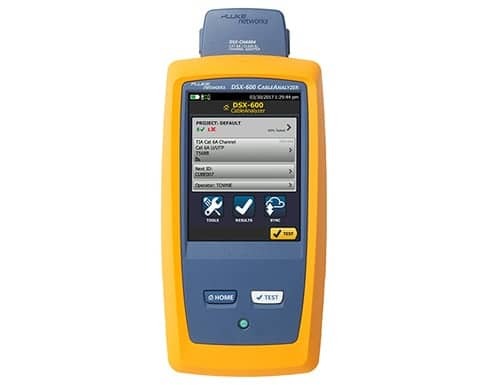 The DSX-600 from Fluke Networks provides essential Cat 6A and Class EA Copper Certification featuring ten second test times and advanced user interface. Manage jobs and testers from any smart device over Wi-Fi with LinkWare™ Live. 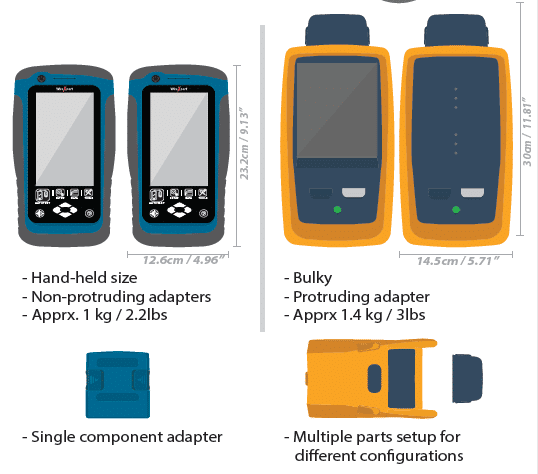 Features legendary Fluke Networks reliability backed by worldwide support. Integrates with LinkWare™ Live to manage jobs and testers from any smart device. Quickly and easily create professional custom PDF reports with LinkWare™ PC. 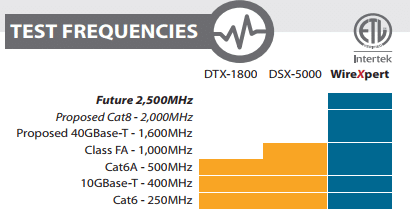 Graphically displays the source of failures, the DSX-600 HDTDR and HDTDX algorithms provide quick, easy-to-understand directions to identify the point of failure (distance from the tester). Managing the testing of multiple jobs with multiple teams, testers, and requirements is time consuming and a source of errors. Increasingly larger jobs make project organization more important than ever. The new ProjX management system on the DSX-600 CableAnalyzer provides individual project files for all job specific details to be saved under a simple name, eliminating the need to re-enter job specific details after starting a project. This minimizes set-up errors or lost files when switching from one job to another or utilizing multiple testers on a single job. In addition, it provides test results by cable ID, merges any changes without duplicates and defaults to the last copper or fiber module installed. ProjX management system provides real time status to completion on each job with a 0-100% scale and gives the operator the option to isolate any test requiring a second look and helps to assure nothing is overlooked. The “Fix Later” selection creates a punch list or automatic to do list for correcting any workmanship issues. ProjX enables project managers and crew leaders to be truly efficient. No tester offers so much speed for so many tests. Complete copper certification to Cat 6A in 10 seconds . Quickly get a Pass or Fail result and easily review individual test parameters by value or drill into specific area on a graph. Leveraging the popular and multi-featured LinkWare PC management software application, DSX-600 users can easily access the ProjX management system data, generate reports, and upgrade the software in their testers. Project Managers have full capabilities to manage workflow and consolidate test results. Users can provide the finishing touch by adding their company logo to the report and offer it unaltered to their customers for system acceptance purposes. 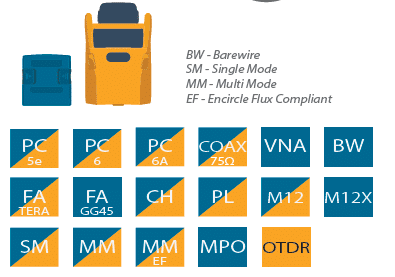 Keep your business tools simple, no matter which Fluke Networks copper or fiber tester you are using, LinkWare PC is the software package that reports it all. Now with LinkWare PC stats, the new automated statistical report option, you can move above and beyond the page-per-link report and see your entire cabling infrastructure. It analyzes and transforms LinkWare PC test results data into charts and diagrams that reveal your cabling plant performance; this report summarizes your entire cabling infrastructure in a compact, graphical format that makes it easy to verify margins and to spot anomalies. Keep track of every test on every job. Get an overview of every project from any smart device. Drill down to each individual test. Instantly receive notification of incorrect test setting or cable IDs. Get it right the first time. Define cable IDs and test settings from your PC or tablet. Keep your testers up to date. Standards can change without notice, and an out-of-date test report can mean hours of re-testing. LinkWare Live automatically ensures your testers are running the latest. 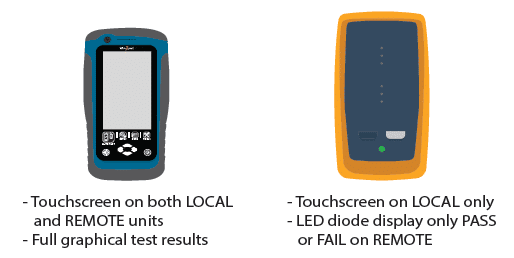 Stop wasting time and gas driving testers back to the office. Upload your test results straight from the job site to LinkWare Live over Wi-Fi. Then download them automatically to the right job for fast report generation with LinkWare PC.